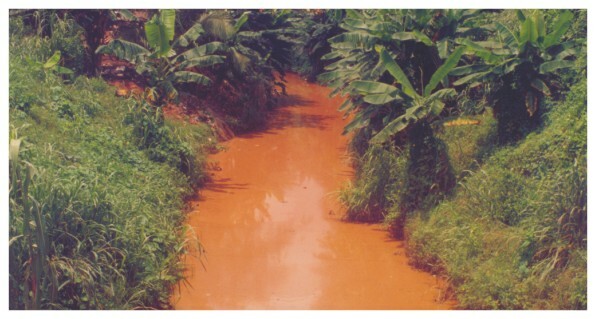 ​The Benin Moat (Iya in the local language) was built as a defensive fortification around Benin City in the great Kingdom during the time it was at its height and when the kingdom engaged in many wars. The Benin walls consisted of a combination of ramparts and moats. The ramparts ranged in size from shallow traces to gigantic 20-meter-high (66 feet) around Benin City. It covered a border distance of 16,000km. It enclosed 6500km² of community land. Its construction is estimated to have started as early as 800AD. It was finally completed around 1460AD. It provided a defensive barrier against invaders. Shortly after the wall and the ditch were completed, the Portuguese visited Benin in 1472 AD. At that time, it was considered the world's largest earthwork. European visitors travel notes described the Great wall of Benin e.g. Dapper 1668.
in terms of length, and the series of earthen ramparts as the most extensive earthwork in the world. They extend for some 16,000 kilometres in all, in a mosaic of more than 500 interconnected settlement boundaries. They cover 6,500 square kilometres and were all dug by the Edo people. In all, they are four times longer than the Great Wall of China, and consumed a hundred times more material than the Great Pyramid of Cheops. They took an estimated 150 million hours of digging to construct, and are perhaps the largest single archaeological phenomenon on the planet. Considered one of the great wonders of the world, the walls were built of a ditch and dike structure. The ditch was dug to form an inner moat and the excavated earth from this was used to construct the external rampart. Its construction method predates the use of modern earth-moving equipment or technology. Oba Oguola (1280 – 1295) completed the 1st and the 2nd moats. He decreed construction of 20 smaller moats around other important towns and villages to protect them against invaders. In the 15th century during the reign of Oba Ewuare the Great (1440 -1473) an extension of the moat which was about 3200km was constructed. This fortified bastion allowed entry to the city from nine gates to be controlled. At night the gates were locked. As lines of defence, the moats were heavily guarded around the clock. They stopped invaders as they could be seen whilst trying to get through and were killed or captured by the Benin soldiers guarding the gates and walls. The ramparts which were steep banks of earth stopped invaders climbing over them as they could be buried in sand avalanche and sand on their weapons could disable them. The high walls made it difficult for attackers and invaders to climb over. Invaders trying to climb the walls were good targets for the Benin soldiers’ spears and poisoned arrows. The outer walls which were very high provided a thick shield around the city. Their nine gates restricted access to the city. 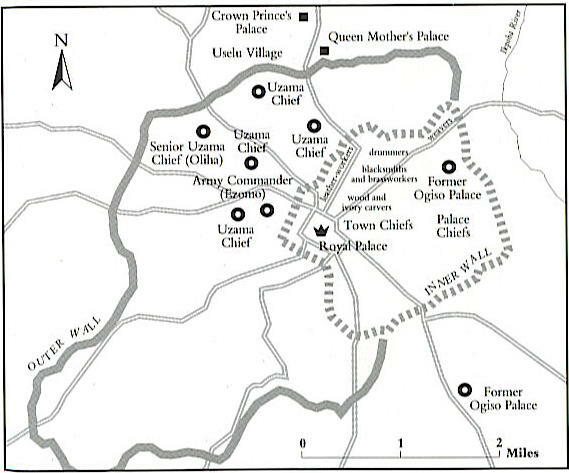 The heart of Benin, the capital city of the Great Kingdom, was bordered by the inner wall. This was as high and as wide as a two-storey building and ten kilometres long, it surrounded the most important parts of the city like the Royal Palace and the Chiefs houses. Outside this wall was a ditch as deep and as wide as the wall. A massive fortified earthwork entrance gateway guarded travellers’ way in. It was supported by timber and guarded by soldiers with swords slung under their left armpits. A heavy wooden door blocked the gateway. A traveller bringing goods into the city would usually have to pay a toll before the gate was opened. In addition, the upper parts of the city were surrounded by the outer walls. These were high earthen walls, dull red in colour, carefully smoothed into a series of horizontal ripples. The tops of these walls were roofed to prevent them being washed away by the rain. A great thatched gate was guarded by more soldiers whom the traveller had to identify themselves to before admission to these parts of the city. These were the areas where the Uzama chiefs and the Army commander lived. All visitors or travellers to any part of Benin City had to pass through these securities before gaining access. For some this was no mean feat. For many foreign visitors, it took days for them to see the king. For some traders it was far simpler to conduct their trade outside the town and city borders. This was also at the period the Transatlantic Slave Trade was booming and raids on towns and villages by African and European slavers were very common. This defence mechanism in addition to Benin tribal marks on the forehead helped to ensure that no Benin person was ever enslaved for the purposes of the Transatlantic Slave Trade. Did you know: The walls kept out Europeans slavers who were in search of slaves to transport to the Caribbean and the Americas on their slave ships across the Atlantic Ocean. 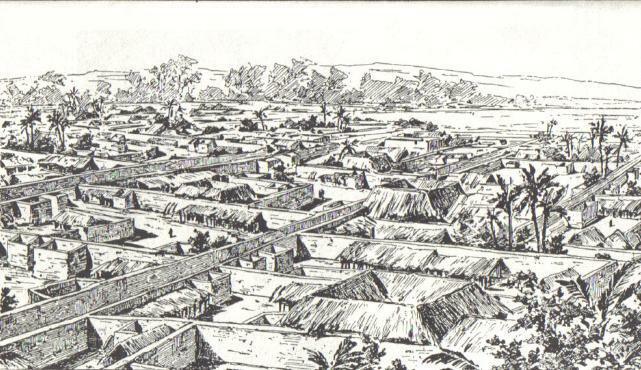 Drawing of Benin City by a British officer in 1897.